Chris is our Executive Head Chef in our Oxford Circus venue and he has cooked up a storm since joining us in November 2013. Chris has always loved cooking but he decided to turn up his passion into his job 13 years ago while in New Zealand. Since then he has worked in various establishments in New Zealand, Cornwall and London where he moved 10 years ago. Before joining L’atelier des Chefs, Chris worked in gastro pubs in Hertordshire and with Paul Merrett in ‘The Victoria’ in Richmond. Before becoming a Chef, I used to work as a professional waiter in New Zealand. Even if I really enjoyed my job, my true passion always lied in preparing food itself and playing with flavours and textures. Being given the opportunity to train as a professional Chef really enabled me to live my passion on a daily basis. After a three year apprenticeship, my first experience as a Chef was in ‘Le Bon Boli’ in Christchurch, New Zealand, under the guidance of Head Chef Philip Kraal. This is where I gained a love for working in a high end fine dining restaurant. Later on, I moved to the UK and I worked in various Gastropub establishments and also ‘Chez Bruce’. Even if I truly enjoyed working in professional kitchens I soon felt the need to move on and share my love and expertise in cooking with customers. Like all my colleagues at L’atelier des Chefs, I am not just interested in food but I also love talking about it and sharing my knowledge with people. 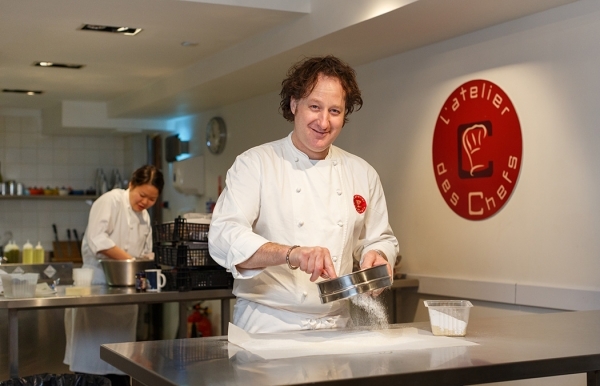 L’atelier des Chefs is the ideal place for it as all the classes are convivial and informal. It is all about useful skills you can then apply at home but also about having some fun, meet new people and enjoy some great food! To me L’atelier des Chefs is the ultimate venue for any food lover who wants to embrace food and cooking. I do not have a signature dish as such. What I love cooking, however, is a delicious Sunday roast with all the trimmings. I like being informal and make my food accessible to everyone. You’ll often find large platters of food on my table where family, friends and children can help themselves, enjoy their meal in a relaxed atmosphere, without fuss. There are a few classes that I really like cooking. My first one would be the curry class as I really enjoy Indian flavours and I often cook it at home. I also find the French classes interesting to teach as many of the recipes are essential to know for anyone truly interested in cooking. Finally, I always find the pasta classes really fun to teach. People love playing with dough and are always amazed on how easy it is to actually make your own pasta and sauce! Try a recipe of your choice, play with it and repeat it until you are fully happy with it and its flavours. Also make sure that you get sensible cooking books which are accessible and not too technical.